Out of a single boutique, already on the map for breaking some of the most influential designers of the day in an unorthodox clubby milieu, he and his third wife Gale Hayman brazenly conceived of and went to market with a signature fragrance—an inconceivable feat in 1981 for anyone outside the cultural and style hubs of New York and Paris, let alone the inexperienced owners of an independent shop. Never mind that Giorgio Beverly Hills came out of California. It flaunted its hometown in the brand name and its extravagant launch on Rodeo Drive rivaled only that of Yves Saint Laurent’s Opium thousands of miles away. The Haymans took a premium scent and made it accessible through the pioneering of scented strips and direct mail and eventually a bombshell sale that would keep them in milk and honey, but not before a war of the roses that has kept the once high-profile pair far apart and uncommunicative. 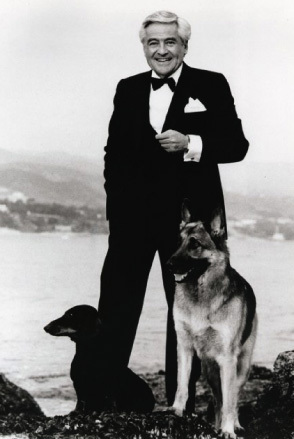 Fred Hayman took standards of a luxe life—from his childhood in Zurich and Paris; his formative adult years rising the ranks at one of the world’s grandest hotels, the Waldorf-Astoria; then catering to celebrities, socialites and fashion designers at the modern beacon of the Beverly Hilton—and accorded them his own flair. He brought the Golden Globes to its longstanding home, and served for over a dozen-plus years as official fashion coordinator for the Academy Awards. He proved a Midas with every gamble he made, and usually with a wide-eyed hubris that would bring on fans and foes alike. Fred Hayman was the unofficial arbiter of fin de siècle gilt as conveyed to Middle America in Dynasty and Scruples, whose stars and creators also were his clients (and the latter was inspired by and took place in a store resembling Giorgio). He extolled and exploited the possibilities of this palm-tree lined fantasy island with a Rolls Royce delivering customer purchases, four-pound tins of Beluga and live mariachis at every party, yet he made everyone feel at home by his comforting hospitality and rule breaking. Fresh starlet and vintage comedian alike could be spotted swigging a drink at the oak bar or next to the pool table, amidst a hodgepodge of garishly painted ceramic panthers, untamed ferns and frocks, furs and trinkets, from the moderate to overpriced. Decades later, no one bats an eye at this high-low mix of merchandise and diversions, what business writers and brand makers dub retailtainment, the democratizing of fashion, the commodification of lifestyle. At the time, it was half-baked in the opinion of some, plain naive to others—and pioneering for so many more. The sunny awnings might be gone from the street, but Fred Hayman’s impact continues into his retirement, from public artworks to civic philanthropy. To Rodeo Drive, he remains its marketing architect, its godfather, its greatest showman. And in doing so, Fred Hayman made the extraordinary difference.